Design a healthy 'Protein snack' or 'Protein drink' to provide energy whilst exercising. This could be in the form of a recipe, a poster, a labelled sketch or diagram or an advert. This homework is due in for the week of 1/4/19. Active Learn maths homework. Please log on to Active Learn to complete any tasks which have not been completed and the most up to date which was added this week. The most recently added game is on the far right of the selection of allocated games. School code m96a. Homework is due to be completed by Monday 18th March. Choose an organ of the human body and either research it, build it, draw a diagram or in some way show your findings through creative means. Due in on Monday 11th March. I hope you've all had a relaxing and enjoyable half term break. For the first three weeks of this half term, our topic is 'Skin Deep' which will focus on human biology. During these three weeks we will add in our S.R.E. lessons in which the children will learn to understand and recognise changes in their bodies. Letters will be sent home with more information about this set of lessons. In the second half of the half term we will be doing a project called 'Enterprise' during which, groups of children will work together in teams to create a hypothetical product to pitch to the Coed Glas Dragons' Den. The remainder of the 10 swimming sessions will also be completed over the next few weeks. It should be a fun and interesting half term, I can't wait to see what the children come up with! This half term is all about competing. First we have the Rotary Club competitions of story and public speaking then we have Eisteddfod and the fabled Bardic poem! To start this off with a bang we have organised a fantastic creative writing workshop run by an expert. This term is the term for Year 6 pupils to push themselves forward in their learning. We usually see huge progress made here. When we revamped and changed our curriculum we gave a lot of thought about where to put our fabulous Enterprise topic. So this is it's new home! This half term before Easter will be science led culminating in our three week Enterprise topic ending with a brilliant Enterprise fayre for pupils and family to attend. During the lead up to the fayre, pupils will use Movie Maker to create adverts (always great fun and hilarious to watch), use Google Forms to find out what the public would buy and present their design ideas to a Dragon's Den panel. This topic requires mature teamwork skills and from past experience, regardless of product design, the groups who work very well together are the most successful. Life is all about people! The homework this week is to complete the Higher order thinking skills task for the book allocated on Giglets. Or a piece of written research. A date for your diaries! Year 6 will be inviting you to our VE day party on Thursday 13th December. 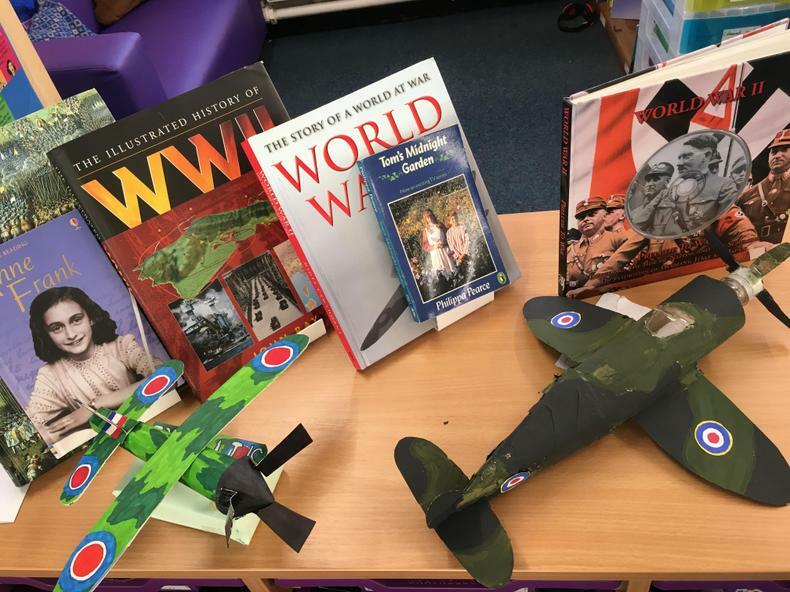 I have updated and checked all of the children’s Giglets and Active Learn accounts so that they all have things to get on with during the holidays alongside their reading and times tables practise in their homework books and the creative task (create a Spitfire or Hurricane WW2 fighther plane). If anyone completes a Giglets task, I will mark it and allocate a new book straight away. I hope you all have a lovely holiday, see you in a week! Although the majority of homework is online with Giglets and Active Learn, since we have a creative task every few weeks, we wanted the children all to have a book that they could use for research, ideas and any other practise they feel that they need. Also, in the back of the books, there is a section for recording home reading. Although many of the children now read to themselves at home, which is great, it would be beneficial to them to read aloud to somebody at home each week as well. This helps with pronunciation, diction and expression. It also helps with their comprehension and gives the children an opportunity to ask if there is a word or phrase they don't understand. Each time they have read at home, please fill in the reading record and sign it. I will then countersign it when they get back to school and they will receive some gems which we use as motivational points for their group. The group with the most gems at the end of the week wins a prize. Their reading books should be coming home with them each day and then they should bring them back into school the following morning. If you'd prefer to do some written work on this that is fine too. Please encourage the children to practise their times tables and reading alongside this task during half term, Giglets will also be updated and available to them for some extra reading and comprehension practise. You might have seen our tweet about scraps of material. We will be starting to make bunting for a VE day party at the end of next half term so if anyone has any bits of material or outgrown unwanted clothes we could cut up that would be fantastic. Our VE day party will be for parents/grandparents/guardians too! I'll update everyone with the arranged date asap. Welcome to Mrs Goode's Class! Wow, we are really powering through year 6. Last term's achievements showed us just what these fantastic children are capable of! We have very high hopes for the next term where we will be looking for the children to start taking serious responsibility for their own progress. We will continue to provide great opportunities to broaden their experiences and provide the platform for them to achieve to their highest potential. We were extremely happy to see such brilliant attendance last term as this has a direct link to achievement. Let's continue with this and who knows, maybe we might win the attendance!